Blasting the Canadian authorities for denying visas to Indian security officials, former Canadian health minister and Indo-Canadian leader Ujjal Dosanjh said Ottawa was treating the Indian security agencies like the erstwhile KGB. "Will they dare do this to the Chinese or Israelis? Never. I am very angry about how the Canadian government is treating individual members of Indian security agencies," he said. "By their action, the Canadian authorities have shown that they are treating India's Border Security Force (BSF) and the Intelligence Bureau like they treated the KGB. It is very embarrassing and India is justifiably angry," Dosanjh said. "Indian security agencies may have the same kind of operational difficulties that Israeli forces are going through in the Middle East. But Canadians dare not treat Israeli agencies the way are treating Indian agencies. "This case shows that Citizenship and Immigration Canada (the department dealing with immigration and visa issues) is setting itself up as a judge on the entire democratic system in India. It is not acceptable at all." 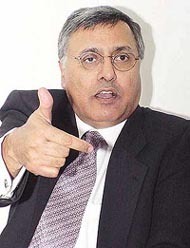 Dosanjh, who in 2000 became Canada's first non-white premier (equal to chief minister in India) by getting elected to the top post in British Columbia province, said: "The Canadian authorities are inappropriately treating members of Indian security forces as a class. They are individuals and their cases should be dealt with individually. India is not perfect, nor is Canada. "Canada has to decide now whether they want to have any meaningful relationship with India. If they are serious, they will have to send a strong message to the missions in Delhi and elsewhere that it is inappropriate to treat members of security forces as a class. I justify India's anger."